CHRISTIAN PULISIC ON THE COVER OF THE MARCH 2019 ISSUE OF WORLD SOCCER MAGAZINE. 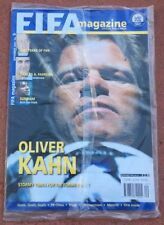 GREAT ITEM TO COLLECT IF YOU ARE A FAN OF WORLD SOCCER! 1975 Sports Illustrated Back Issue - PELE cover (New York Cosmos). ITEM: A back issue of Sports Illustrated dated June 23, 1975. This issue features the legendary Pele on the cover in his New York Cosmos strip (“Pele’s Triumphant Debut”). CONDITION: VERY GOOD … (light wear and aging). 1 of 4 different World Cup Preview Issues. No Exceptions! 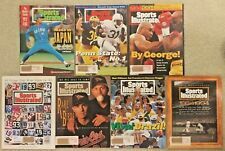 Sports Illustrated Seven Assorted Issues From Dec 1993 - Nov 1994. Good Condition (very small tear at one staple in binding, & 3/4" tear at bottom left corner at binding). August 16, 1994: 40th Anniversary 1954 - 1994 Issue Eddie Matthews Cover. 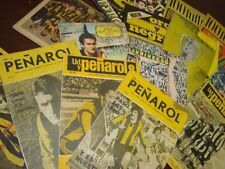 THEY HAVE BEEN IN A PLASTIC BIN SINCE THE EARLY 70'S, SO ALMOST ALL ARE IN REALLY GOOD SHAPE WITH PAGES INTACT. No Label NEWSSTAND 6-29-2015 Sports Illustrated issue / complete magazine featuring Jordan Spieth on the cover after his record breaking 2015 US OPEN ! The sheet has the Christian McCaffrey RC Rookie card. All my magazines range from EX to Mint Condition. No Exceptions! 1 of 4 regional covers for this week for the Fifa 2014 World Cup Preview Issue. No Exceptions! Program is in great shape. Not perfect but lightly used and rare. Very cool Sting soccer program in great shape per the pictures. Sports Illustrated featuring soccer great Pele on the cover. See pictures for exact condition. Sports Illustrated - 5/21/79 - Giorgio Chinaglia cover (NASL soccer, NY Cosmos). ITEM: A back issue of Sports Illustrated magazine from May 12, 1979. CONDITION: GOOD … (light to moderate wear and aging). JANUARY 1965 WORLD SPORTS MAGAZINE! 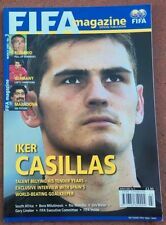 CHELSEA SOCCER COVER! JANUARY 1965 WORLD SPORTS MAGAZINE! CHELSEA SOCCER COVER! This lot contains 1 January 1965 issue of World Sports magazine in excellent condition, light age and handling wear. Chelsea soccer front cover. Magazine is in great shape per the pictures. Very cool old sting program in great shape. Magazine is in NEW condition, as shown in photos. June 9th 2014 Newsstand issue Sports Illustrated magazine w/ Luis Suarez on the cover. Mint Condition Quality magazine. Here's a really scarce publication for the hobby publication collector.1st edition (vol. stapled upper left, light creasing near corners but overall condition fairly nice. a card I describe as nr.mt-mt. ). 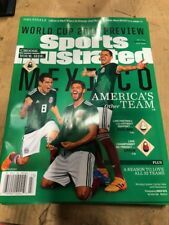 June 8th 2015 Sports Illustrated magazine with Sydney Leroux on the cover. This issue was a regional issue and very tough to locate . Free Shipping/Handling w/ USPS. Sports Illustrated - 7/3/78 - Argentina World Cup Winners - Daniel Passarella. ITEM: A back issue of Sports Illustrated magazine from July 3, 1978. CONDITION: GOOD … (light to moderate wear and aging). Denis Potvin April 16, 1979, Giorgio Chinaglia May 2, 1979, George Bamberger April 30, 1979. 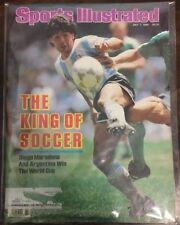 Sports Illustrated - 7/7/86 - Argentina World Cup cover - Diego Maradona. ITEM: A back issue of Sports Illustrated magazine from July 7, 1986. CONDITION: GOOD … (light to moderate wear and aging). 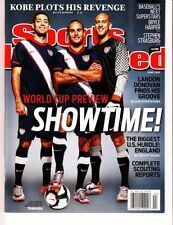 JUNE 2010 Sports Illustrated for Kids Magazine w/ LANDON DONOVAN on the cover! This is a newsstand magazine! It`s complete w/ a tight spine ,great color,displays well. This MAGAZINE STILL HAS THE CARDS INTACT INSIDE. July 4 1994 Ernie Stewart USA Soccer Signed Sports Illustrated. Shipped with USPS First Class Package. DIEGO MARADONA. DIEGO MARDADONA. SPORTS ILLUSTRATED. JULY 7, 1986. IN THE WORLD CUP FINAL. ON THE COVER OF THIS 33 YEAR-OLD EDITION OF S. I. BUT "THE LABEL HAS BEEN CLEANLY REMOVED". THE COVER IS IN EXCELLENT CONDITION. May 30, 2016 Sports Illustrated Magazine! He is currently THE best soccer player in the world!